Oblong Industries is inviting visitors to InfoComm 2018 to experience next-generation workflows with its UC platform, Mezzanine. 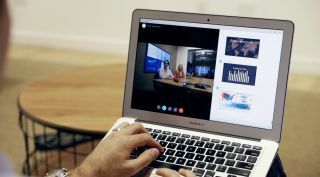 By integrating Mezzanine with popular workstream collaboration products such as Cisco Webex Teams (formerly known as Spark), coworkers can move between the desktop workstream of a Webex Teams environment to a multiuser, multi-location, multi-stream Mezzanine meeting space with ease. Mezzanine is a flexible solution that scales up to large architectural spaces with the Mezzanine 600 Series, and down to conference rooms and huddle spaces with the Mezzanine 200 Series. According to Oblong, it’s perfectly suited to be the standard for content-rich, real-time collaborative work across the enterprise. Collaborators in all Mezzanine-enabled workplace settings can see and control all the content and data streams that are essential to the task at hand. The Mezzanine 200 Series will be integrated with Cisco Webex Teams at InfoComm 2018 in Booth N752.